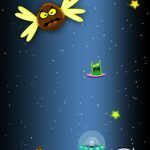 Little UFO is a bit of a surprising app. 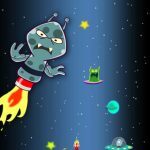 It seems like a million other iPhone games out there, yet it does prove to be surprisingly addictive and seems to have that magic ‘one more go’ attribute. 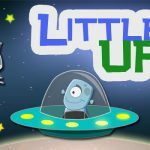 It does have a few kinks that the developer needs to iron out, with one issue in particular standing out, but Little UFO is an enjoyable time waster. 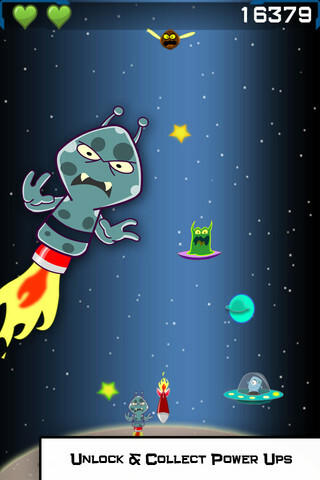 The game tasks you with taking the reins of the titular Little UFO, and you must travel vertically up the screen as far into space as possible, all the while dodging the attempts of various life forms and rockets to blow you out of the sky. You tilt your iPhone to make the UFO move to the left and right, with the forward motion happening automatically, like many endless climbers. A neat trick here is the fact that the screen is wrapped, so leaving the screen one one side will see your UFO appearing on the other. It reminds me of a lot of ancient arcade games that employed this technique, and like them it can either be your saviour or your doom. If used correctly it can save your life, but it is all too easy to run into trouble if you use it rashly. 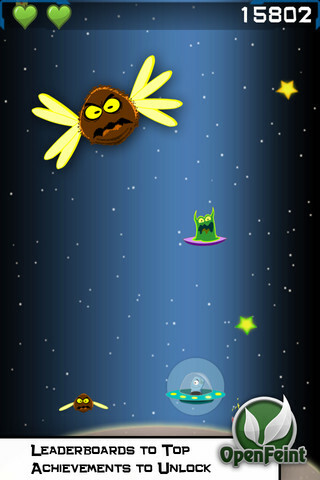 The enemies come thick and fast and have various routines, with some aliens just dropping like a stone, while others come in at an angle. A touch of anything will see your precious heart count, which starts at just two, drop by one, although if you hit a rocket during the very first wave of the game, it will kill you with one hit, regardless of your heart count. Every few minutes, you pass a checkpoint which also coincides with making the enemies faster and tougher, and so the game goes on until you are eventually destroyed. There are some extras that can be unlocked after you first get to certain score thresholds, such as a bomb that wipes out all enemies, a shield, an invisibility cloak and finally extra hearts. Once unlocked, these pickups will fall randomly from the beginning of any future game. 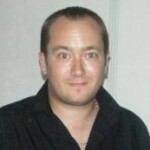 The ability to post your scores to Facebook is also a great inclusion. The game does has some problems, however. I wish there were different backgrounds for each checkpoint, and the option of touch control would be nice. The sound, which is actually pretty good, is turned off by default, and also tends to cut out when restarting a game, but a bigger problem is one of collision detection. The collision detection is off by about 10%, meaning that enemies can hurt and kill you, even if you are not quite touching them. This does need sorting out, although it isn’t a huge problem until you get to the later, faster stages. Overall though, I came away pretty pleased with Little UFO. It is a simple little game with a nice soundtrack, decent bouncy gameplay and a natural addictiveness.